From Alphas to zinc-coated insignia, Marines and Sailors pride themselves on staying sharp in uniform. 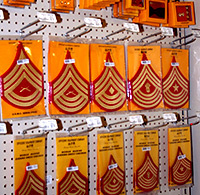 Replace those green or white T-shirts, belt buckles or covers at the Military Clothing Sales Store, located adjacent to the MCX Annex. Did you earn a promotion? You will need to purchase that new rank insignia. 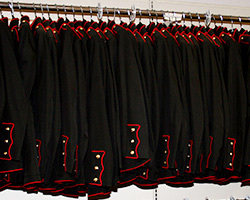 Everything you need for your Marine and most Navy uniforms can be secured here. The store also includes a Warrior Library complete with the Commandant’s reading list. Don’t wait until the day before an inspection to perfect your uniform – stop by the Military Clothing Sales Store today. Professional tailoring is available for most alteration needs. 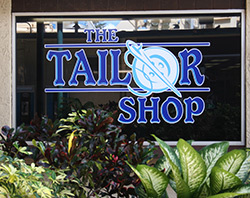 The Tailor Shop specializes in uniform alterations and more. Working hard all day and can’t find the time to get the laundry finished? Then check out K-Bay’s 24-hour Laundromat. Located in Building #1255, next to the Bank of Hawaii and Tennis Court, the Laundromat has washers and dryers of all sizes, for all types of jobs. Next business day service no extra charge. The bright Vanguard-red “EzRackbuilder” state of the art self service touch screen computer kiosk that allows customers to build virtual military medal and ribbon racks on its computer touchscreen using the popular EzRackbuilder software program. Customers enter their award information and the EzRackbuilder places all of the medals and ribbons in perfect order of precedence on its screen in addition to precisely affixing all of the attachments and devices to those awards according to the user’s branch of service regulations. Customers can then actually order the ready-to-wear product with a personal credit card. Orders are shipped directly to the customer. Located inside the Military Clothing Store at the Annex, Bldg 1090.